Valencia CF: Wilfried Bony to transfer to Valencia CF? Wilfried Bony to transfer to Valencia CF? Wilfried Bony to Valencia CF? With more and more certainty that Jonas Goncalves is going to move to the Premier League in England, either to Tottenham or Liverpool, Valencia CF is looking for possible replacements for Jonas. One player that has caught the eye of Braulio Vasqiuez is Wilfried Bony and Valencia CF is interested in bringing him in. 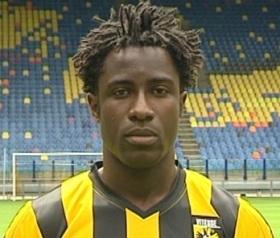 Wilfried Bony currently plays as a Striker for Eredivisie club Vitesse Arnhem and has also featured for Cote D'Ivorie. He is 23 years old, so a young player and possible long term solution for Valencia CF. He has scored 27 goals for Vitesse. Valencia CF is likely looking to make some good money on the transfer market this winter in order to be able to fund few reinforcements and with Jonas price at 10 million and more it would be enough to fund at least two new players, certainly Wilfried Bony as he is valued at about 7 million euros, though his realistic value is probably somewhere around 5 million euros, big plus for Valencia CF is that his contract runs out in 2014 and he is not likely to extend it.